Keep in touch over Easter, or for other special days, by writing notes or letters on your own homemade Victorian stationery. This beautiful stationery can be personalized in so many different ways. Choose the one that is right for you. Referring to the photo, you’ll see the large white doily (cut out from a 9 inch square doily) top, centre on a blue paper and the yellow stationery has corner cut-outs of round doilies with a green paper between. You can paint your doilies if you like. To paint your doilies (using regular artists acrylic), place them right side up on a styrofoam plate, paint the top of your doily, transfer your doily to a clean styrofoam plate to dry. Your doily will dry quite fast. Once dry, glue your doily in place on your sheet of card stock. 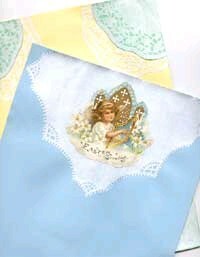 Glue a little vignette or cut out on top of your doily making sure that the complete cut out is covered with glue. Place a piece of parchmount paper over the glue area of your sheet, then place books or some other heavy object to weigh down your sheet. This will prevent your sheet from warping, while it is drying. You can mail these pretty sheets, but photo copying them is a great idea. The colours will come through perfectly on a copy and if you want a quality paper, you can have them copied onto a card stock, rather than standard weight copy paper. You can make seals to use for sheets of paper by simply folding your sheet in four and attaching a seal to one edge. To make seals, simply cut the centres from doilies and attach them with a glue stick or cut several and glue to a sheet of paper. You can make several (enough to fill an 8 1/2 x 11 sheet of paper) and have this sheet photocopied onto a label sheet. You simply cut out your seals from the label sheet and the label backing will stick to your envelopes, eliminating the need to glue them in place. This is a wonderful gift idea and can be personalized with monograms, family photos and so many other memorable pictures. Be creative with this stationery and have fun!